The Indian system of "Ayurveda" looks at your unique body type, or “dosha,” when it comes to your eating habits and many believe it to be the key to maintaining your optimum weight and overall health. 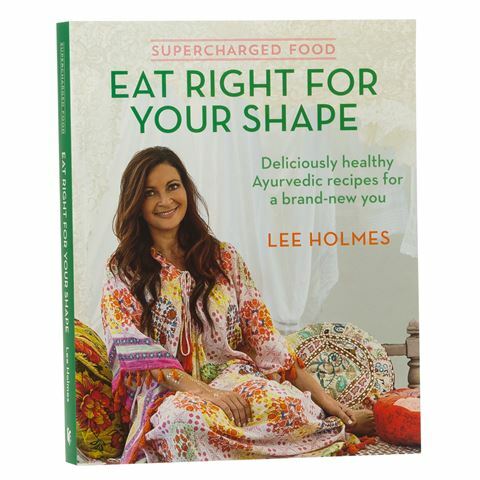 In Eat Right For Your Shape, holistic health coach and yoga teacher, Lee Holmes offers readers a practical guide to achieving the ideal weight for your body type – with an assortment of healthy recipes and chapters dedicated to the Ayurvedic lifestyle, yoga and breathing exercises. There are recipes for Spinach Pancakes, Summer Breakfast Parfait, Spicy Lamb Koftas, Indian Infused Chicken and more. However, readers should consider Eat Right For Your Shape so much more than a cookbook…it’s a lifestyle change – for the better. Includes an assortment of healthy ‘Ayurvedic’ recipes. Recipes are divided into each season, as well as year-round staples and fasting. Chapters dedicated to the Ayurvedic lifestyle, yoga and breathing exercises.